Our Muscat cruise port guide gives you information about the docking location, cruise dock, transportation options and much more! – Cruise ships dock in Muscat. – Walking in port is strictly prohibited. – Cruise port is about 1,2 mile from center of town (Muttrah). – There is a hop on hop off bus. – Plenty of official taxis available for tours or short rides. When you look from a higher deck you are able to see your cruise ship’s docks in an industrial port. Oman has tries to make it as convenient as possible to welcome cruise guests in this destination. 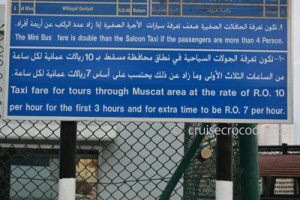 There is no walking allowed in port and therefore a shuttle service is offered to Muttrah, one of the most attractive areas of Muscat that lies right in front of the port. These are the taxi prices as they are displayed at the port. Taxis do not have a meter and therefore you will need to negotiate before getting in. Please know they advice you a taxi tour should be about 10 Omani rial per hour for the first 3 hours and for extra time 7 Omani Rial per hour. 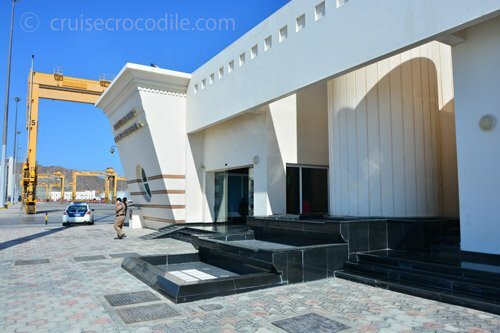 In the Muscat cruise terminal building you’ll find shops, internet and security. The building is located right on the dock. 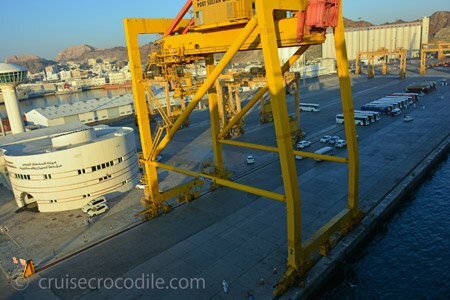 In Muscat cruise ships usually dock at Port of Sultan Qaboos, berth 4 and 5. This is the official port of Muscat that lies in front of Muttrah. There is no tourist information and no maps available on the dock. There is a terminal building which is not always open. The cruise dock is wheelchair accessible. Walking in the port is prohibited and therefore there is a shuttle bus provided by the ship. This shuttle bus usually goes to the port gate and to the Mutrah souk. It is wise not to get off at the port gates, because in general you will only find taxis waiting for you there and nothing else. If you choose to be dropped off at the Mutrah souk you are in one of the three most interesting areas in the city. – Mutrah. This is where the cruise shuttle bus will drop you off. It is about 2 km / 1,2 mile from the port. Here you’ll find the famous Muscat corniche, the Mutrah souk, the Bait Al Baranda Museum and the Incense burner. – Ruwi. This neighbourhood is about 6 km / 3,5 miles from your cruise port. You could consider this as “downtown” Muscat. – Old Muscat. About 7 km / 4,5 miles from your cruise port. This is definitely one area not to miss on a visit to Muscat. Amongst others you’ll find Al Jalali fort, Al Mirani fort, Qasr Al Alam Royal Palace and Bait Al Zubair museum here. Muscat facilities are pretty good. Keep in mind that the city is quit spread out and therefore you’ll need some form of transportation. Find out underneath what your options are. There is a public bus service in Oman. You’ll find there are white/green busses and red busses. Although you rarely see them and therefore you’d might just want to skip this form of transportation in Muscat. The official taxis of Oman are white and orange. They do not have meter. You need to negotiate on a price before you step into the taxi. Most taxi drivers will take US dollars or Euro. Taxi fare for tours through Muscat area at the rate of R.O. 10 per hours for the first 3 hours and for extra time to be R.O. 7 per hour. The minibus fare is double than the Saloon Taxi if the passengers are more than 4 person. One way rides can be quite expensive in Oman. For example one way from the port to another neighbourhood is probably 15 US dollar or from the port to the Grand Mosque will probable be around 40 US dollar or 17 RO. To the left is a photo of a sign at the port with the taxi prices on them. This will give you a good idea of what it should costs, but in real life you notice that if rare to get the price as you’ll find it on the sign. Expect that you pay about 15 dollars for a 15 minute taxi drive. Prices like 15 dollars one way per taxi to the Qurum area and 40 dollars one way per taxi to the Grand Mosque are reasonable. There is a hop on hop off bus available in Muscat. This red double bus will be waiting for you at the Mutrah Corniche, often at the same spot as where the cruise shuttle bus will drop you. Sometimes these busses also come onto the pier, but it depends on the kind of arrangements your cruise line has made for them. The Hop on Hop off bus is pretty expensive compared to other places, but Muscat is spread out and therefore Hop on Hop off is already a nice choice just for practical reasons. They do change their facilities every now and then, make sure to check their shuttle bus services with them. – Are taxis allowed on the pier? No, they are not. Unless the taxi has arranged special permission from the port authority. You’ll find taxis at the shuttle bus drop off location. – Are there maps available on the pier? No, they are not. But you’ll find you can buy a map for about 8 dollars in town. – Will taxis take Euro or US dollars? Yes, most of the times they do, but they will change you in Rial. – Will the shops in the souk thake Euro or US dollars? Yes, they often do, but also they will give you change in Rial. Yes, Oman is one of the safest countries in the world. Yes, it is about as clean as Singapore is. – Where can I ride a camel in Muscat? You cannot. This simply is not an attractions in Muscat. – Is there a dresscode to enter the Grand Mosque in Oman? Yes, there is very strict policy! Men should cover their arms and can not wear shorts. Women should cover up their entire arms, legs and hair. – Can you make pictures in the Grand Mosque? Yes, even photo’s with flash are ok to make. – Where is the nearest car rental? The nearest car rental is at Ruwi. You’ll need about a 15 dollar taxi drive to get there. This is where you’ll find a street with all kinds of car rentals on it. In Old Muscat you’ll find the Royal Palace also known as Qasr Al Alam Palace. It serves as the official seat of the government and as the official office of Sultan Qaboos. It is mainly being used for high end visitors and special occasions. From port it is 4,5 km / 10 min drive to the east. Daily tours take place in the morning from 08.30 – 10.30 am. Get a unique look inside this magnificent Opera House which is considered to be one of the best in the world and is considered to be the milestone in the evolution of an Omani architectural style. From port it is 14 km / 15 min drive to the west. At about 40 minute drive from the port you’ll find Qurm beach. Not the best beach to lay down for a tan, but it is a large recreation area to the city. Come here to relax and do what the locals do on their free time. From port it is 13 km / 15 min drive to the west. There are about 500 forts and castles in Oman. A handful of them stand here on the coastline of Oman. In the ancient times they were defensive bastions and watch towers protecting old Muscat. Although used by the Ottoman, Persians and Omani, in 1507 the Portuguese came to Muscat and they took it by brutal force. Most of the forts have now been restored, feeding the imagination of visitors. Find the fortifications about 2 km walk from the shuttle bus drop off locations. There is wi-fi at the terminal building on the dock although this is not always open. If you take the shuttle bus to the Mutrah Corniche you will see a small billboard with the purple wi-fi logo on it like the picture above. Get connected here. When you are in port there is a large chance the Sultan Taboos his yacht will be in port with you. Spot his gigantic yacht on the horizon which used to be the 2nd longest yacht in the world. You can see it from Muttrah and already from the ship. The ship is not open for visitors. This is the absolute must see in Muscat: the Sultan Taboos Grand Mosque. Visit this magnificent mosque and see the world’s second largest hand-woven carpet and chandelier. The mosque is open to the public (non Muslim) between 8 AM and 11 AM every day except Thursday and Friday. The entry is free. No shorts is allowed for men. Women must cover their arms, head and the ankles. Find the mosque about 25 km / 15.5 miles away from the cruise port. The Corniche is the promenade in the sheltered harbour. It is really nice to have a leisurely stroll here for the fact that you’ll pass the old style buildings, large commercial harbour, overlooking the dhows in port and get acquainted with the true Omani heritage and style in the many forms of art on the street and surrounding area. The corniche is where the shuttle bus drops you off. This is the market you’ll find at the drop off location of the shuttle bus. It is the city’s oldest market and it is still very popular among young and old. Go in and a feel for the vibe of the market. You’ll find its the perfect place to pick up your souvenirs. Typical products for sell are frankincense, shoes, silver antiques and metal crafts. Keep in mind it does roughly closes between 11.30 am and 04.30 pm. Cruise ships dock at the Muscat port close to the neighbourhood of Mutrah. Find your shore excursion busses on the pier or take the shuttle bus to the local market. For the full information on your transportation options read the Muscat cruise port guide. You’ll find this bus at the corniche where it has it start and end point. Sometimes cruise ships arrange to have it on the dock as well. Check with your front office on board. Muscat is quite stretched out and therefore renting a bicycle is not a bad idea. You’ll find this bicycle spot at the end of the Corniche, about 1 km walk from the shuttle bus drop off location. Check its location on the map. This is one of the best museums of Muscat. It tells you all about the countries history and geology through interactive exhibtions. The museum is in Muttrah. It is best to walk from the shuttle bus drop off point. 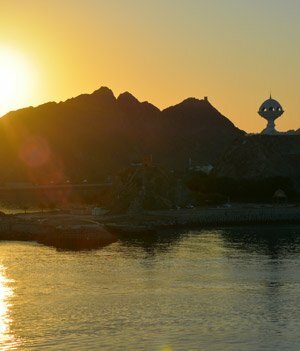 Muttrah is the commercial centre for trade in Muscat and it definitely is also the most scenic and interesting part of Oman. There are plenty of things to do here. Make sure to plan to hang around for a couple of hours as it is the easiest and most diverse area to visit. Muttrah is the neighboorhood in front of the ship. Take the shuttle bus to it. Oman is flexible when it comes to excepting dollars. Most shops will except US dollars but will change you in Omani Rial. Sailing into Muscat is spectacular. Make sure to be on the outside deck about an hour before you dock because it will give you a spectacular view over the town and its surrounding landscapes. Frankincense has a prominent place in the history of Oman. Therefore it is expected that Oman would honour this product as much as they can. One piece of art sitting on the shore lines of Oman is the incense burner. You can spot it already from the ship. It is about 2 km / 25 minute walk from the drop off location of the shuttle bus. The most impressive hotel of Muscat. 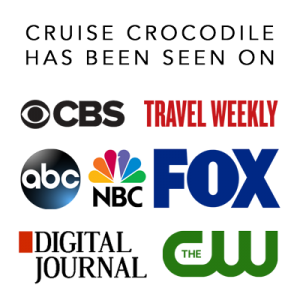 You’ll notice that cruise lines often offer a high tea shore excursion to it. If this is the case go for it. Independent visitors often get turned down. The hotel is known as the modern legend of Oman with its Arabian and Indian design. From port it is 13 km / 15 min drive to the south east.